You know that BRAC would not be the effective harborer of creative interpretations of environmental justice if we did not learn and gain so much from our partner and parent organization—the Bronx River Alliance (BxRA). BxRA supports and protects every step and effort we all make to do good in and for the Bronx River and the residents of the Bronx. Now it is time for all of us to come out and support BxRA and enjoy a wonderful evening of celebration for their 11th Anniversary event at the new banquette room of the Bronx Zoo. Please consider carefully what really means something to you and what you can do to help. 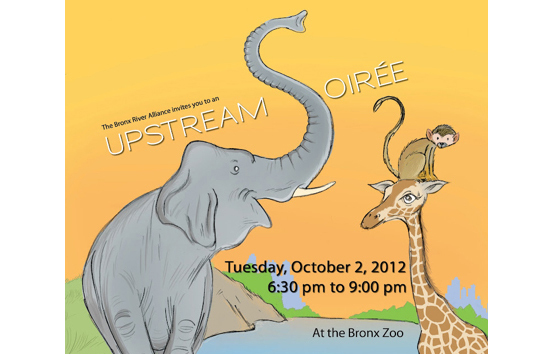 Join me in feeling good about supporting a GREAT cause and great success that is the Bronx River Alliance. Click the link HERE to purchase your ticket(s) and I’ll see you there on October 2nd! Join the Bronx River Alliance for their annual benefit and enjoy a festive dinner with music, cocktails and a silent auction that will help support the important work on the Bronx River. Patron and Benefactor ticket holders will enjoy a special reception and tour through the Zoo's Madagascar exhibit starting at 6 pm. Celebrate the rebirth of the river with honorees Maria Hinojosa, anchor and executive producer of the NPR program Latino USA, and Kim Mathews, principal of Mathews Nielsen, who crafted the design guidelines for the Bronx River Greenway and created the award-winning Master Plan for Shoelace Park. Also with LIVE Latin Jazz & Salsa by Chico Álvarez (WBAI Radio host) & RumbaySón.